Originally the site of the landmark St. Moritz Hotel, The Ritz-Carlton New York, Central Park offers the charm of an elegant private home in the heart of the city. 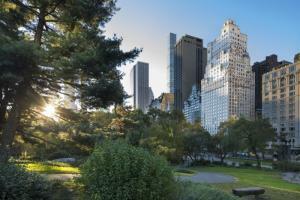 Featuring well-appointed accommodations, a La Prairie Spa, and four dining options, the hotel's prime midtown Manhattan address affords unrivaled skyline views and an easy walk to shopping on Fifth and Madison Avenues, Radio City Music Hall, the Museum of Modern Art, Carnegie Hall, and Lincoln Center. 57th street subway station is 2 blocks away, and LaGuardia Airport is approximately 5 miles from the hotel.